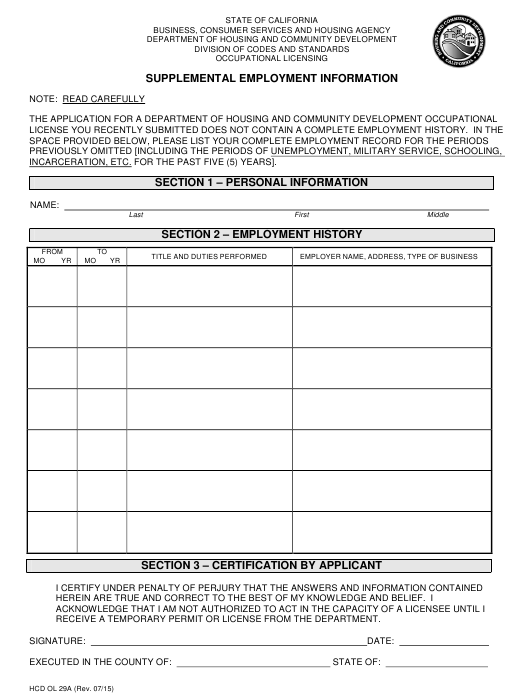 Form HCD OL29A is a California Department of Housing & Community Development form also known as the "Supplemental Employment Information". The latest edition of the form was released in July 1, 2015 and is available for digital filing. Download an up-to-date Form HCD OL29A in PDF-format down below or look it up on the California Department of Housing & Community Development Forms website. INCARCERATION, ETC. FOR THE PAST FIVE (5) YEARS]. RECEIVE A TEMPORARY PERMIT OR LICENSE FROM THE DEPARTMENT.